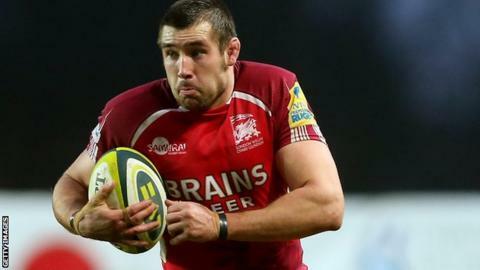 Championship high-flyers London Welsh ran in six tries in a 45-7 thrashing of relegation-threatened Jersey. Drew Locke's early score gave the islanders a 7-3 lead, but winger Joe Ajuwa sprinted through to put the hosts ahead. Scrum-half Tyson Keats went over to extend the advantage further before the break. John Quill (2), Matt Corker and Toby L'Estrange claimed second-half tries to give London Welsh the bonus-point win. The result, coupled with bottom club Ealing's 37-35 nail biting victory over Nottingham means Jersey are just three points off the foot of the table with two matches to go. One side will be relegated to National One. Meanwhile London Welsh have won seven in a row and are already guaranteed a place in the play-offs as they try to bounce back to the Premiership at the first time of asking. London Welsh: L'Estrange, Ajuwa, Tonga'uiha, May (capt), Scott, Davies, Keats, Hepburn, Morris, Ryan, Corker, Spencer, Lees, Quill, Browne. Replacements: Davis, Trevett, Griffiths, Pienaar, Thorpe, Lewis, O'Neill. Jersey: Burroughs, Pointer, Locke, McCrea, Dawson, Penberthy, Dudley, Lockwood, Taione, Selway, Campbell, Markham, Buckle, Hodson, Maidment. Replacements: Stratford, Fidler, McCarthy, Voss, Brown, Griffiths, Bishop.